Here is an interesting detail on an 85mm Wenger Pen blade. I will explain and back up everything I have written on the picture. It is not easy to picture this curve because it will show as a shadow and so on. 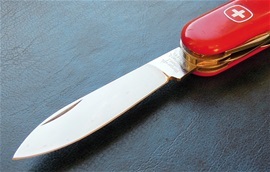 On SAKhome.com I have discussed and looked for interesting and important evolution factors on Wenger knives. Some time ago I wrote some and discussed how this Company all the way in history changes some details on the design that can be for the evolution, running change, modern design and safety factors to protect the products they make. Some details are so small that many have a hard time to distinguish them. All the way during the Wenger history we see changes in the products for the development of the knives and because of new production methods. On Wenger Swiss Army Knives the emblem and tang stamp is very important. I mentioned how the grind sometimes in history got a more even line towards the stamp and some got the abrupt hard angle. On this it got an angle that get bigger towards the back of the blade and it is also curved nicely. This is a very deliberate design on purpose. Next in the history of this Brand the grind from the blade towards this angle and tang design got several variations in history. On this there is something to make a mark in the evolution on. The grind is very nicely curved or rounded and it starts very early. On many knives this is faint or small. On this it seems it is made effort to show this on the face of the knife. It is a very deliberate design factor. It is also the evidence about my research that these two areas on the blades are used for something extra. The blade design and edge itself also got its own evolution changes all the way in history. Basically this early curve meets the angle on the tang towards the stamp to change the appearance of the product. It is polished nicely. I have used a magnifier to see if anyone has tampered with this blade. It would not be easy to tamper in such a fashion. I have noticed that on some products Wenger actually did use 85mm blades that are a bit specially designed for the precision towards other functions depending on how many functions it got. This can be on 2-5 layers SAKs. I hope my information makes sense and I do not sound like a fruitcake. I do not know what the professional words for these design factors are so I called what I feel is the best. I looked over the surface again to see if this blade has been changed or tampered with. On the picture to the right is the blade again. It is not easy to see in such light. The difference however is significant and compared to others it is distinct. It got an exaggerated curve compared to others and that both curves are so distinct makes it extra interesting. In a production it is unavoidable that you will find production variations that I have mentioned many times before. It this case it is not production variation. In the production it is unavoidable that new production methods influence the design. With Wenger it is sometimes ahead of this and actually they actually just waited for new technological innovations could arrive so they could put their plans ahead. If you look on the top picture on this page then it is unavoidable to see that this design is not usual. It has been grinded and polished with precision for the appearance of the design and product. That part is in my opinion just as important as the tang stamp. I would not be surprised if they are very much related. These + the stamp itself and the emblem are important. I got my eyes on this little design difference and I will not make anything out of chance. When I use a magnifier I look for difference in the surface and if people tamper or polish then this would show as a difference in the surface. It is polished with great skill and it must be original. I use a digital caliper to see if there is something unusual with the blade thickness. The tang part got the same thickness as usual at this time window. From before I know that you can find a few small differences from batch to batch. This blade got a small extra thickness at some parts of the blade and this may influence the grind as well. This SAK is probably not any more valuable with money. For me it is super valuable for research. There is something with this blade and have a wonderful time for my hobby with this. If you look on the other side of the 85mm blade towards the shank or tang you can see the backside grind is different from the main side. This is because the grind and tang stamp with the emblem is the face outwards on of the knives. On my knife it is just the main side two curves that are different; the backside grind is more traditionally but not completely either. It seems that Wenger change the appearance on a regular basis. It does not go too many years before you will find grind differences and changes in the emblem. From before I have researched the tang stamp itself with the obvious differences in the crossbow. The placing and depth of the complete stamp must also be into consideration. Every few years Wenger changes important design factors. I noticed that the tang stamp could go unchanged for a long time until I used a magnifier to see that the modules were absolutely not the same. It may look the same and they are original but different. I would also like to mention that there must not be any doubt that Wenger changed the appearance on a regular basis. The evolution on Swiss Army Knives is seriously a factor that this Company implemented. Production variations can sometimes be so that where the stamp is placed and minor grind differences can be because of the production only. The tang stamp may sometimes be placed different just because of more random production. There are an enormous amount of blades made. It must also be seriously taken into consideration that Swiss icons and symbols are protected by law and the Factory implements safety precautions for this. I can guarantee that there is a code sometimes. The knife I have shown on the pictures got so different grind and details that it is important to research fully. Here you see the backside on my knife and it is traditionally different from the main side. Only a small unusual difference on it. It got some spots and substances on that i will try to remove gently. I would also like to mention that the shank/tang construction at the contact part vs. the slip-joint spring is polished more round. This is normal to see on Wenger knives and also this got several variations in history. Hi, do not hesitate to send me any questions.